Some businesses make it big because of hard work and dedication of the founding members. Some business models start with a simple idea, and morph quickly into something way beyond the original goals. And some businesses make it big because they happen to be in the right place at the right time. As a business owner, and someone who’s had three successful businesses over the past 20 years, I love reading stories about other businesses. A successful person will always tell you to read biographies of other successful people. The same holds true with successful businesses. Which is one of the reasons I couldn’t put Viral Loop, by Adam L Penenberg down once I picked it up. 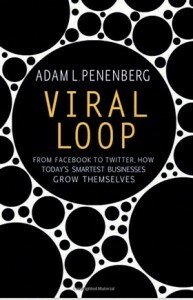 Penenberg approached this book to look at successful companies that took the Internet by storm, creating a viral loop that allowed them to grow substantially in a very short period of time. Some of the best known companies online right now succeeded because of this viral loop – think Flickr, Facebook and Twitter. But rather than start us out looking at the now most famous online companies that are common hoursehold names, Penenberg chose to take us back to some of the early starts. Tupperware grew into a national phenomena due to a joint venture between two people: Earl Silas Tupper, the inventor of Tupperware, and Brownie Wise, a top sales distributor with Stanley Home Products. Wise was a single mother, who moved through the ranks of Stanley due to her in home party concept. When she discovered Tupperware, she instantly knew the party concept would be a quick way to grow the Tupperware line. And grow it did. Very quickly her top dealers were bringing in up to $1500 a week through the party concept (that’s $14,000 in today’s dollars). These parties gave us two marketing techniques that are still used today, and have heavy impact in the viral loop created by today’s top online companies. Women loved Tupperware because their friends told them all about it. Not only could they tell their friends about it, but they could also tell their friends about a way to make money and get free product too. Hold your own party, and you can earn bonus gifts. Become a party organizer, and make a few dollars on the side. And women ate the concept up. It wasn’t a matter of seeing something on the shelves, not knowing what it was. Their friends confided in them about something new, something amazing for running an efficient home. From there you gain insight on different marketing strategies, and different ways to turn your concept into a viral machine. This weekend I finished up The Whuffie Factor by Tara Hunt. With most business books I grab them, visit the table of contents and read one or two things that stand out to me. But as I started reading through The Whuffie Factor, I found myself drawn in, and having to go back a chapter or two to find out even more information. So I started at the beginning, and dedicated myself to the whole book. And along the way started looking at my 2010 plans for social networking in a whole new way. Even though I’m heavily active in Web 2.0 technology, have been blogging and participating in social networks for years, there’s always something new to learn. Tara doesn’t just write about ideas – she gives case studies along the way that actually make you think about how you can apply things to your own business. For example, she introduces us to Jonathan Coulton, a former software developer who was able to quit his day job, and do what he is passionate about – music. He doesn’t have a record label. Instead he makes use of social. His secret? He tries everything, and sticks with things that work. He encourages people to record him and place the videos on YouTube. This has led to hundreds of videos posted, and millions being driven to his site. Instead of selling traditional CDs and MP3s, he gives the majority of them away for free. When people like what he has to offer, they head back to his site, sometimes buying more of his music, or some of his merchandise. Or even buying sponsorship through his virtual bananas, monkeys and robots. 1. Perhaps you are finding out for yourself that it is getting easier and easier for customers to ignore you. In fact, maybe it seems that the louder you yell, the more they tune you out. This is happening because the airwaves are polluted, people have been burned too many times, and too much choice without clear differentiation makes customers miserable.